Das WeltAuto is the place where the dealerships of the VW Group offer a wide range of tested, maintained and repaired used vehicles. 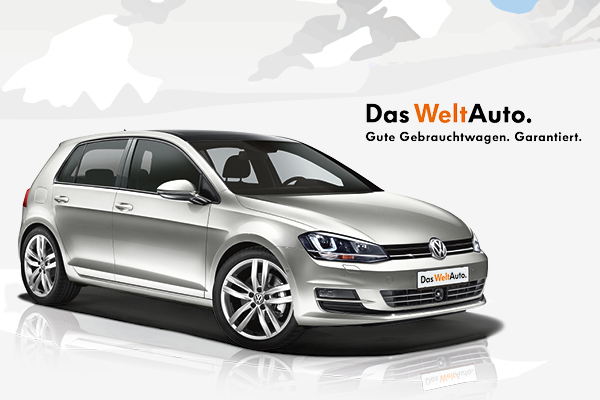 The Das WeltAuto market supports the advertising of these used vehicles on the Internet. Participating dealerships as well as private sellers present their used vehicles online here. Additionally, company cars of the Porsche Holding are put on sale via the Das WeltAuto market. All used vehicles that the car dealerships process with Porsche Informatik retail systems are automatically presented on the Internet. Campaigns and special offers, e.g. new vehicle brands and marketing campaigns defined by the dealerships themselves, round off the offer. The Porsche Bank loan and leasing calculator allows you to directly calculate the right financing when searching for a vehicle. The switch to responsive design in December 2016 made the vehicle search even more convenient for customers: The optimised web application can now be used on smartphones and tablets without restrictions. The market can be accessed via the (www.dasweltauto.at) homepage, or via the car dealership Internet presence, where the used vehicle stock of the dealership / dealership group is displayed.